Starting the festivities in one of Sydney’s celebrated festivals, the Sydney Festival 2013, is the arrival of the giant Rubber Duck on Cockle Bay in Darling Harbour. The 15m high, yellow duck artwork of Florentijn Hofman is this year’s opening salvo to a series of celebrations for this annual festival. The Rubber Duck, which has gone through numerous rounds across the globe, docking (or I should say ‘duck-ing’) in several waterways in famed cities, such as Osaka, Amsterdam and Auckland among others, worldwide. The famed artwork brings joy and excitement to the people, especially the kids and the young-at heart, around the world. 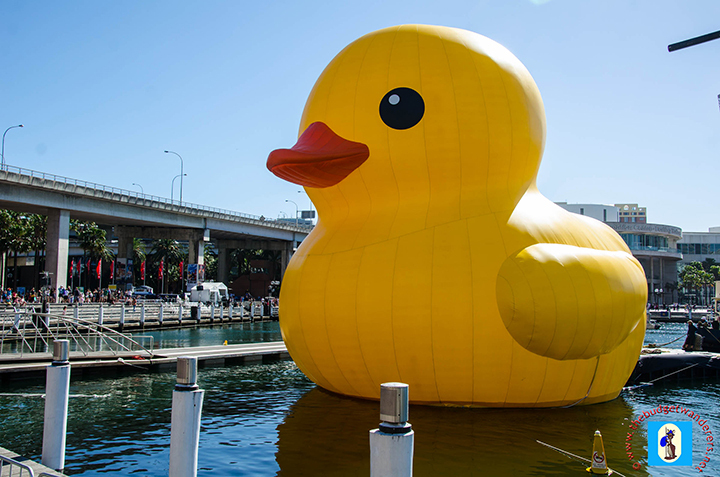 Darling Harbour Bridge announces the arrival of its distinguished guest, The Rubber Duck. 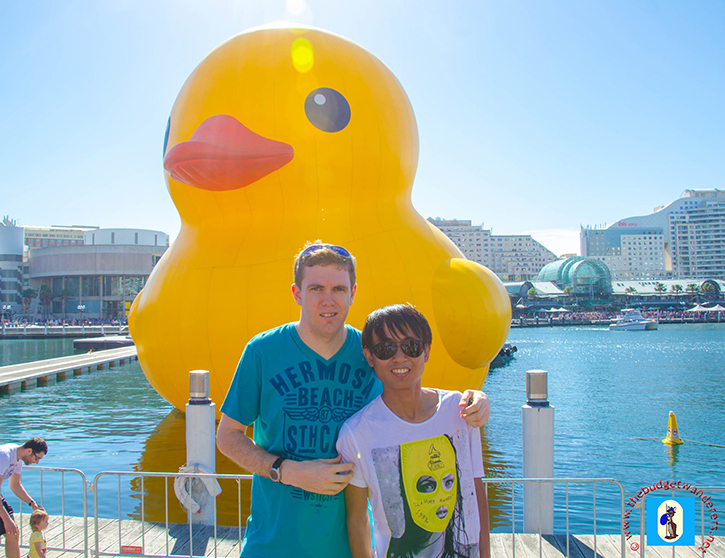 This year, it’s Sydney’s turn to make way for the giant Rubber Duck. And no fitting place for it, but the ever famous waters of Darling Harbour, a waterfront attraction to most Sydneysiders and overseas visitors, due to its overwhelming smorgasbord of attractions suited for the whole family, the solo traveller and the circle-of-friends. The Rubber Duck at Cockle Bay in Darling Harbour. 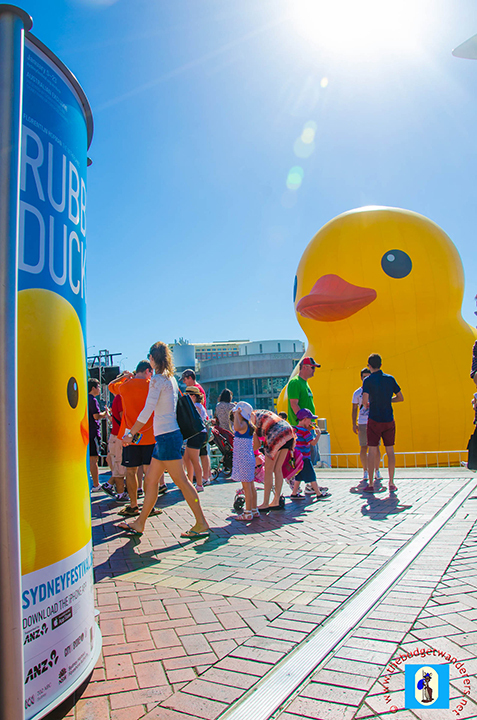 The Rubber Duck will be stationed at Cockle Bay in Darling Harbour for the whole duration of the celebrations. It will be a reminder that the Sydney Festival 2013 will be a fiesta worth celebrating, as its icon symbolises the child-like fun we all wished for a festival to be! 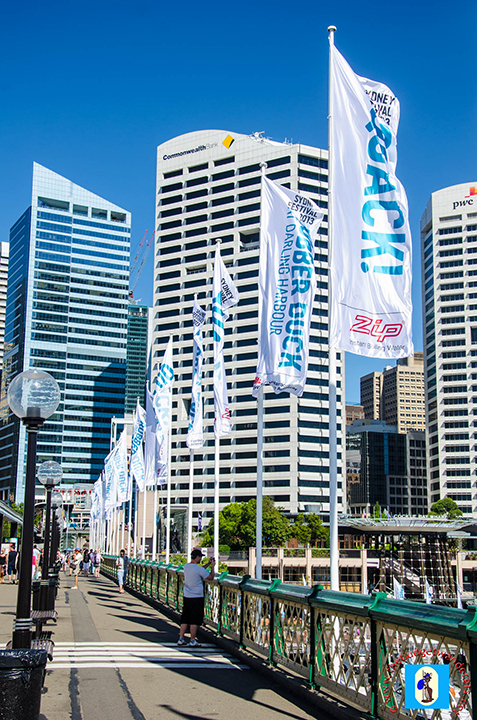 Sydney Festival 2013 runs until January 27 with exciting and fun-filled daily activities for the whole family. Visit their website for further details on the various activities. However, for those who are overseas, read about selected activities of the festival here in our blog, The Budget Wanderers. The Budget Wanderers take time to pose with the Rubber Duck. I can’t wait to bring the kids to see this giant rubber duck. Thanks for the post Sean and Michael! Looks really fun to me. The kids will definitely love it, Marge. 🙂 Thanks for reading. I have been reading your posts for quite sometime already and this is my first comment on your post. I like the way you present them in a very simple and readable manner. Thanks for that! We greatly appreciate you for reading our blog posts. wow that is indeed a giant rubber duck, very cute. Looks beautiful. Yeah, it is really huge. I’m not sure about it but when we went there, we saw a small boat near Darling Harbour which has a Rubber Duck in front of it. We never bothered to ask if its for the parade that day or was it for kids and visitors who wished to ride a boat with a Rubber Duck with it. I must get down to see the Rubber Ducky soon. So far I’ve only seen the top of his head from the Western Distributor. I enjoyed artist Mr Hofman’s out-of-town tryout for this work in Amsterdam, though his Dutch one was smaller (cramped little country, I presume). It’s becoming a regular art theme, isn’t it – taking an everyday object and making an oversized version of it? Very true. Not just adults like us liked it. The kids are just amazed by it too. The rubber duck reawakened the kid in me. Thanks. My wife has a much smaller version in her bathroom! Adorable!